Note: My completed Star Map visualization has been on Tableau Public for a couple of weeks now and a few people have expressed interest in hearing how it was built, so this post will take you through my process of creating the visualization. If you’re not interested in all the details, feel free to skip to the end to see the final result. For my purposes, however, the most important thing to know is that these “Astronomical Coordinates” can be used to calculate 3-dimensional coordinates (usually denoted by x, y, and z) for the stars. 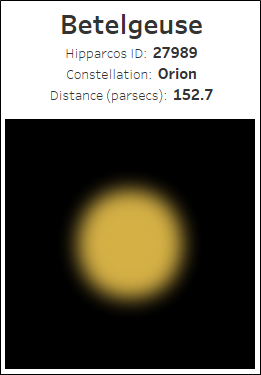 And, with these coordinates, I’d be able to visualize the stars in Tableau. Now that I knew this could be done, I needed to find some data. It took me a while, but I eventually discovered The HYG Database, which includes almost 120,000 different stars compiled from the three most commonly used star catalogs, Hipparcos, Yale Bright Star, and Gliese. For my purposes, I wanted to focus on those stars that are visible to the naked eye, so I removed non-visible stars based on the star magnitude, which measures how bright a star appears from Earth. Stars with low magnitudes are very bright—the sun has a magnitude of -26.7—and stars with a high magnitude are dim. 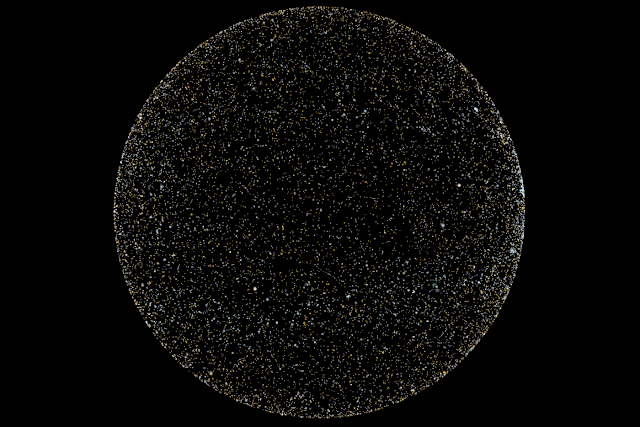 At around magnitude 7, stars can no longer be seen by the naked eye, so I removed those from the database, leaving me with about 15,000 stars. The database contains just about every imaginable detail about each star. I did not need a lot of these, but a few of them would be key to my visualization. 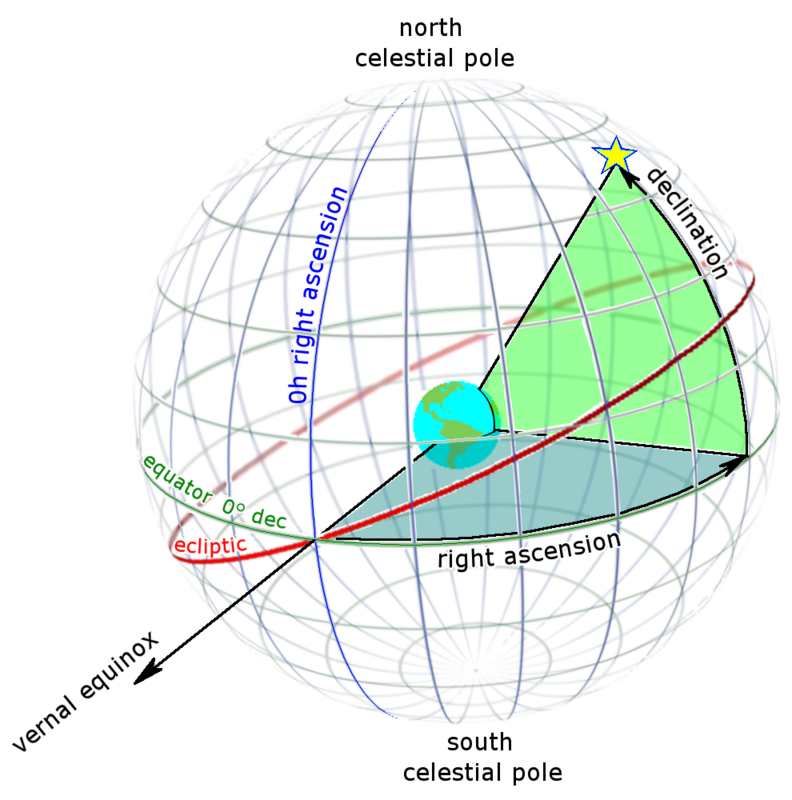 Of course, Distance, Right Ascension, Declination, and Magnitude were critical, but I also needed information about the star’s constellation, its ID in various catalogs, and its Color Index, a simple numeric expression which defines the color of the star (we’ll come back to this later). In my case, I wanted to make Distance a constant so that the stars would be projected onto an imaginary sphere. The actual value is largely unimportant, so I just made it 1. From there, I calculated my x, y, and z coordinates, then leveraged Bora’s calculations to convert these into a 2 dimensional coordinate system. Finally, I plotted the stars’ coordinates in Tableau and sized each star according to magnitude. Note: As I said earlier, the sun is always in the center point. However, I've chosen to hide the sun because it appears significantly brighter in our sky and, therefore, would tend to overshadow all the other stars. But, if you know anything about astronomy, you’ll know that Betelgeuse is a very noticeable orangish red color. So, I wanted to do something adjust each star’s color to more closely match their actual color. To do this, I figured that I’d need to use the Color Index mentioned earlier. Strictly speaking, color index doesn’t directly relate to visible color as there are many things that determine how we perceive color. A star’s color index is not really about our perception but the actual makeup and temperature of the star (for a good discussion on this, check out A Hex on Star Colors). 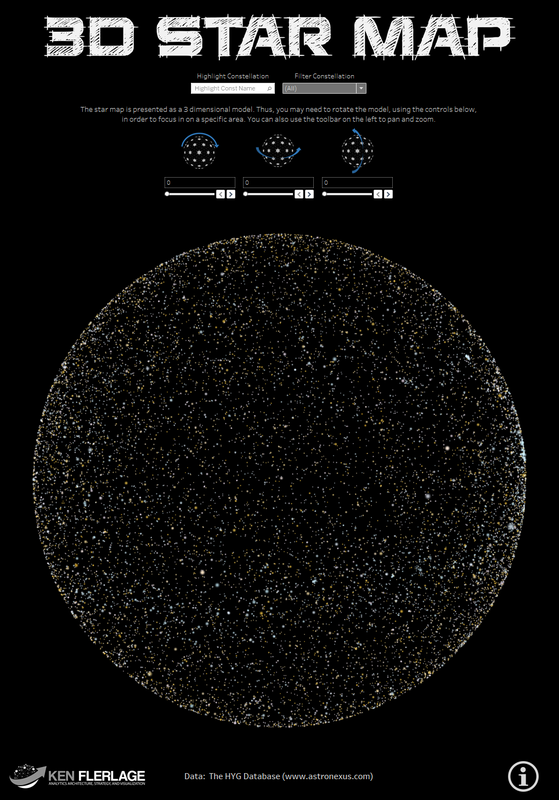 However, color index is the closest we can get to an estimate of a star’s color and should work well enough for our visualization. If you have any thoughts or questions, I’d love to hear about them in the comments section below.